Flow cytometric analysis of Hela cells (blue) and B-TC-6 cells (green) using Insulin (C27C9) Rabbit mAb (PE Conjugate) (solid lines) or a concentration-matched Rabbit (DA1E) mAb IgG XP® Isotype Control (PE Conjugate) #5742 (dashed lines). 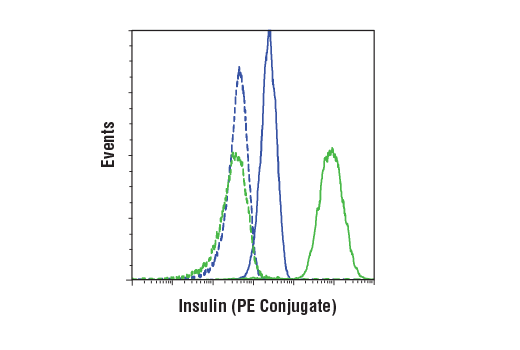 Insulin (C27C9) Rabbit mAb (PE Conjugate) detects endogenous levels of total insulin protein. Monoclonal antibody is produced by immunizing animals with a synthetic peptide corresponding to the sequence of human insulin protein. This Cell Signaling Technology antibody is conjugated to phycoerythrin (PE) and tested in-house for direct flow cytometry analysis in human and mouse cells. The antibody is expected to exhibit the same species cross-reactivity as the unconjugated Insulin (C27C9) Rabbit mAb #3014. The maintenance of glucose homeostasis is an essential physiological process that is regulated by hormones. An elevation in blood glucose levels during feeding stimulates insulin release from pancreatic β cells through a glucose sensing pathway (1). Insulin is synthesized as a precursor molecule, proinsulin, which is processed prior to secretion. A- and B-peptides are joined together by a disulfide bond to form insulin, while the central portion of the precursor molecule is cleaved and released as the C-peptide. Insulin stimulates glucose uptake from blood into skeletal muscle and adipose tissue. Insulin deficiency leads to type 1 diabetes mellitus (2). Straub, S.G. and Sharp, G.W. (2002) Diabetes Metab. Res. Rev. 18, 451-463. Concannon, P. et al. (1998) Nat. Genet. 19, 292-296.